Finding and developing new business opportunities in the recycling sector is crucial to enabling Stewardship Ontario to fulfill its mandate of establishing, funding and operating recycling programs for a growing range of materials. Lyle Clarke, the not-for-profit organization’s vice-president for innovation and the Blue Box, said Stewardship Ontario is constantly seeking industry partners to help build and improve the province’s recycling system, and uses the funds it collects from industry stewards to promote best practices and invest in the system. Clarke was one of the panelists at the last Growing Your Business seminar “Turning Research into Dollars” hosted by the RIC Centre and OCETA. Its crown jewel is Ontario’s renowned Blue Box program. Launched in the 1980s to divert paper and paper packaging from landfills, the iconic Blue Box today graces curbsides worldwide. But has it become a “stale brand” in the current push to create a greener economy? Clarke doesn’t think so. He said a commonly-recognized, yet still well-regarded brand that has lost a little of its novelty luster can indeed make a comeback if it still has underlying value and can take advantage of emerging trends to find a new market value. And the Blue Box can certainly lay claim to underlying value, with its 95% participation rate, unmatched user convenience, breadth of scope, and economic and environmental efficiency, he said. Moreover, the trend in public opinion and a number of resource, economic and environmental drivers are increasingly working in favor of the Blue Box system. Consumers, aware that their purchasing decisions can be part of the problem or part of the solution, are driving the move toward product sustainability, while rising energy costs and greenhouse gas emissions are driving the need for supply chain sustainability, Clarke explained. 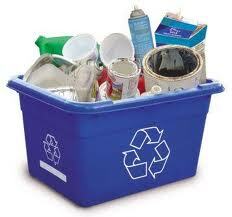 At the same time, higher commodity prices have increased the demand for recyclable materials. Technological innovations are creating new opportunities in the recycling sector, and Stewardship Ontario is looking at the full material recovery/re-use cycle to determine where the best opportunities lie. At this point, the secondary materials sorting and raw material extraction stages are seen as offering the greatest potential. Multi-material packaging is another priority issue, as it offers inherent value but is still difficult to recycle. Stewardship Ontario has the funds to help support the commercialization of business ideas that will contribute to the fulfillment of its core objectives, although it can offer other types of support as well, Lyle noted. More information is available on Stewardship Ontario’s at www.stewardshipontario.ca. Join us for Business Valuation – Busting the Myths: How do Investors Value Your Business at the next Growing Your Business breakfast event series 7:30 a.m. to 10 a.m., Thursday April 14th at the University of Toronto Mississauga?s Faculty Club. Emerging environmental companies, long on innovation but short on capital, have potential access to more than 150 government funding, incentive and rebate programs. The key, says consultant Fred Hausmann, is to navigate the maze of programs to ensure that these entrepreneurs receive the maximum possible support to advance their products or services and grow their firms. Hausmann was one of the panelists at the last Growing Your Business seminar “Turning Research into Dollars” hosted by the RIC Centre and OCETA. FRED is particularly focused on obtaining the full range of tax credits available to companies through the Scientific Research and Experimental Development (SR&ED) tax incentive program. Administered by the Canada Revenue Agency (CRA), it is the largest single source of federal government support for industrial research and development. Companies can recoup up to 68% of eligible R&D expenditures. In recent years, there have been some notable trends and changes in the SR&ED program, Hausmann observed. There has been an increase in the number of auditors and audits of applicant companies, and new application forms have been introduced, requiring briefer descriptions of the applicant’s product or technology and a more streamlined risk analysis outline. At the same time, more supporting documentation is sought. This can be a challenge for smaller, entrepreneurial companies whose focus on innovation may leave little time for reams of paperwork. Inadequate or incomplete documentation is often one of the main reasons a company’s SR&ED claim may be rejected by the CRA. Hausmann pointed out that the difficulties and setbacks encountered in developing or advancing innovative technologies, products or processes need to be as thoroughly documented as the successes. This will give the CRA a full picture of the R&D process and its prospects. Local Search Expert and Unofficial Google Places employee Mike Blumenthal has put together a fantastic infographic that pulls in the intricate nature of local search optimization in a very digestible manner. Mike’s infographic also offers up an overview of online marketing, and a glossary of the different terms used in local search optimization and what they mean to you as a business owner. Here’s an embed of the infographic. See the longform version of Owning Your Local Web Presence at Mike’s blog. I read a quote the other day that caught my eye. It embodied the essence of my consulting practice. It’s expected that effective leaders know how to sort the important from the trivial. That they can routinely manage relationships with key constituencies and align team members for support. But how and from where do the business leaders acquire the skills associated with this decision-making process? Three domains of decision making involves; the people we work with; the strategies that underpin our business plans and the numerous and varied crises that our businesses strive to overcome. It’s a thing of beauty to observe the charismatic leader who shoots from the hip with style and grace and watch his staff lean closer with commitment and support. Equally intriguing to watch is the CEO who is over his head, as he / she bellows veiled threats “we’ll be in serious trouble if we can’t get this project done on time and to budget”. Whether you are running a small department or a global operation, relying on an effective judgment process will give you a framework for evaluating any situation, making the call and making corrections if necessary. I teach business owners that leadership and judgment are intimately connected. That each and every facet of their business requires making judgment calls. How many of us remember Carly Fiorina? I met her a few times and thought that she was a pioneer in the ranks of female executives. But she is remembered for “destroying HP’s culture” – a comment made by others and not me. And everyone seems to love Jack Welch. Few recall that he left GE after failing to complete the $47 billion acquisition of Honeywell. Did these people succeed or fail? It’s a matter of judgment. Throughout our lives each of us makes thousands of judgment calls; from the cereal we eat to the person we marry and the places we work. In business, the cumulative effect of our judgment calls determines the success or failure of our businesses and ourselves. I teach that good judgment is based on a three phase process; the preparation, the call and the execution. That good leadership judgment is supported by the contextual knowledge of one’s self, our social network, the organization in which we work and the stakeholders who look to us for achieving specific business goals. A “leadership judgment framework” should be a tool that leaders use to develop the ability in their Executive Teams. Even though judgment seems to be a singular achievement when a given issue is examined, it’s actually is a blend of management wisdom and leadership action. For me however, judgment will always be about how leaders put their energy into Vision and Strategy. Comments? I’d like to hear about an example of when you lived through the result of an extremely positive or negative judgment call. Steve Sheils is the CEO of Authentic Vision for Change. Steve’s passion is helping companies make the difficult decisions required to achieve profitable growth in this tough economy. He can be reached at 416-819-2004 or by email steve@sheils.com. Visit http://www.authentic-vision.com. Mobile marketing is a fast-growing, quickly-changing arena with a lot of promise to become of the largest advertising forums on the planet. Mobile search marketing is one of the leading subsets of this industry. Google introduced ‘Click-to-Call’ last year as part of its mobile search platform, allowing businesses to list phone numbers with their paid search results (AdWords ads). Since its introduction, Click-to-Call has become hugely popular with ‘millions of calls every month’ initiated by the program, according to Google. These have become one of the largest of the targeted mobile campaign genres, and it’s paying off. The ads and where they are used most often to place calls follows smart phone adoption. Currently, this means that most of the Click-to-Call action is happening in the major cities of the U.S., throughout Europe, and in Japan. The ads are served whenever a phone user accesses the Internet and does a search through Google. Paid results are, as with PC-based searches, tied in with the search subject of the user. If the results include paid advertisements from mobile advertisers, then a Click-to-Call number will also be included. Users can click the number to call the business immediately. When the user has GPS enabled, the search can get even more precise, showing the closest business to them with a Click-to-Call number. Advertisers get themselves listed as a Click-to-Call result by participating in Google’s AdWords phone extensions program. Optionally, the business can also include a location extension to make themselves even more visible to more locally-targeted searchers. These ‘hyper-local’ ads can often be the most productive for an advertiser, according to Google. Since mobile users are statistically more prone to take immediate action when searching for something, advertising on this medium has become very productive. Hit-for-hit, mobile ads can consistently show a two or three times better click-through (or user action) rate than their desktop counterparts. How Does It Pay Off? One company says they’re seeing 200% increase in search results on their mobile platform as compared to their standard Google ads for desktops (comparing hit-for-hit). This means that for every hit they receive via mobile or desktop, they see a 200% higher click-through for mobile than they are seeing for desktops. This is a national company. Local advertisers are seeing even greater results. A small, local shop says that their online search marketing has shown almost no measurable result in increased business. They started using mobile advertising through Google and have seen a 9-12% higher first-time-customer walk-in rate. No matter how you look at it, mobile advertising is becoming the ‘next big thing’ in marketing. For businesses both local and national (or even international), it’s going to be one of the biggest marketing arenas out there. This will become even more true as smart phones continue their phenomenal growth rate and proliferation. AMES BURCHILL shows individuals and companies how to profit from the innovative use of Internet technologies, strategic content and social media marketing. You can find out more at James’ website and you can subscribe to his J-List and get over 40 articles, reports and advice on Internet Marketing today. The RIC blog is designed as a showcase for entrepreneurs and innovation. Our guest bloggers provide a wealth of information based on their personal experiences. Visit RIC Centre for more information on how RIC can accelerate your ideas to market.